Mauna Kea Beach, one of the best Big Island beaches. Those visiting the Big Island of Hawaii will certainly see that it has much to offer. For one, there’s one of the world’s most active volcanoes, Kilauea. You can find it in one of the nation’s most interesting national parks, Hawaii Volcanoes National Park. There’s also Mauna Kea, the world tallest mountain if measured from the bottom of the ocean floor. Because it offers so many interesting things to see and do, some may not know about one of the best Big Island beaches. One of the things that you can’t find on the Big Island is a lot of white sand beaches. This is because this island is the youngest of all the Hawaiian Islands. As a result, its shore areas have not yet faced the same kind of geologic forces that have eroded the other Hawaiian Islands. Such forces have created many of the beautiful white sand beaches you can find on Oahu, Maui and Kauai. But this is not to say that the Big Island is without any great beaches. And one of the beaches it has is of world class stature, at least according to National Geographic. In June of 2016, National Geographic identified the top 10 beaches in the world. And Kauna’oa Bay on the Big Island’s North Kohala Coast was on that list. People also call it Mauna Kea Beach for the hotel of the same name that fronts it. Mauna Kea Beach is a quarter mile long crescent bay with a pristine white sand beach, clear blue waters and picturesque palm trees. What makes this place extra special is that during the evenings, the Mauna Kea Hotel lights up the bay. The night-time lights attract plankton, which in turn, attracts numerous manta rays which dine on them. The gentle manta rays congregating and feeding in the night light of the bay offers an unusual spectacle for those who witness it. 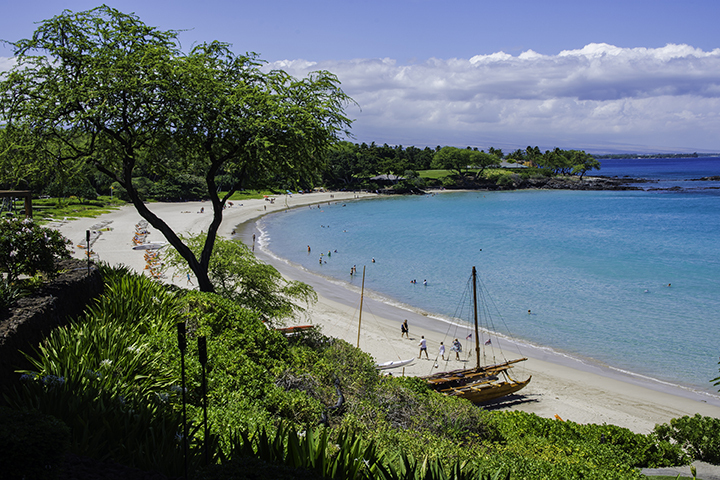 Even though it is associated with the upscale five-star Mauna Kea Beach Hotel, all beaches in the State of Hawaii are public. So anyone can use the beach, even if you are not staying at the hotel. However, the hotels owns the beach parking lot and there are only 40 spaces for the general public. The rest of the parking spaces are reserved for hotel guests. So if you plan to use the beach, and are not staying at the hotel, plan on going there early. If however, you can’t get access into one of the 40 public spaces, you can always head south and try nearby Hapuna Beach. This is also a nice white sand beach and the parking lot there rarely fills up. 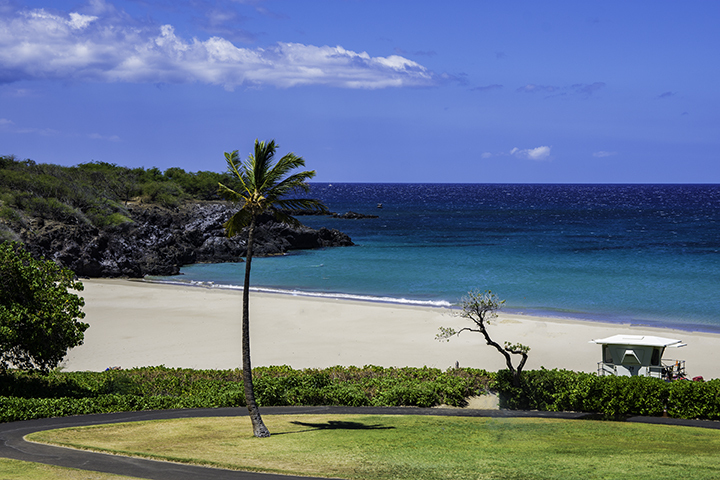 Some consider Hapuna Beach one of the best Big Island beaches. Normally, the waters in this area are calm. But in the winter months, the water tends to be rougher. Non swimmers or those people who are not good swimmers should exercise caution. This is because the beaches here are not always patrolled by life guards.